The clinical orthopaedic surgical research tradition was established by Professor Otto Sneppen in 1980. 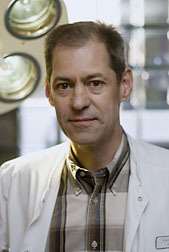 Today the research group is managed by Professor Kjeld Søballe, MD (picture). The group currently constists of 36 post.docs, 18 PhD students and approx. ten pregraduate research students. The group has a wide national cooperation with surgical as well as medical departments and a strong international cooperation with among others: USA, New Zealand, Finland, Holland and Ireland. The group has a solid background in clinical as well as basic research and a rewarding interdiciplinary cooperation transversely to traditional professional groups. The core research areas include etiology, the prevention and treatment of illnesses in joints and muscles. The research activity in the group is strongly increasing. The total number of published articles is 272 of which 110 articles have been published within the last five years. In 2010 alone the group has published 26 articles.